Watching as a young lad from the platform at Grantham in the early 1960s there was something especially memorable about the express freights. Perhaps they were somehow symbolic of the main line railway earning its keep and doing the job it was built for – the speedy shipment of goods needed urgently in another part of the country. So let’s go to the south end of Grantham station as the shadows lengthen on a still evening in the early 1960s. The Down Main signals clear, and a minute or so later there’s that first glimpse through the Spitalgate bridge, far away to the south. Compared with a non-stop passenger train the approach is slightly slower, giving an extended period of anticipation. By the time the locomotive is close enough to identify its class you can see the line of wagons, rippling and weaving along behind. With a whistle and a flash of wheels and coupling rods the locomotive tears past, the platform trembling under the soles of your shoes. Then a deafening, crashing rhythm is hammered, machine-gun like, from the jointed rails by up to a hundred pairs of wheels. Tough steel impacting tough steel with blows faster than a forgehammer. The loose corner of a wagon sheet flaps in the smoky, dust-laden slipstream. As the crescendo dies down, your gaze follows a swaying brake van through the station and around the north curve as it hangs on to the trail of buffeting wagons snaking away into the distance. With the senses still tingling from all that stimulation, and the smell of the smoke lingering in the air, it’s time to leave for the bus home. Our first photograph shows an A4 locomotive on a fully fitted express freight. ‘Fully fitted’ means that every vehicle on this train was equipped, or ‘fitted’, with the automatic vacuum brake controlled by the driver and, in emergency, by the guard. Such trains, designated ‘Class C’, could travel at faster speeds than ordinary freight trains, which might have brakes only on the locomotive and the guard’s brake van. The Class of a train was indicated by the number and position of the front headlamps – in this case one in the central position, above the coupling hook, and another over the right buffer. A4 No. 60002 Sir Murrough Wilson of Gateshead (52A) motive power depot approaches the station at speed with a northbound fully fitted express freight train on 31st August 1961. This is thought to be the daily ‘Scotch Goods’ service departing from London King's Cross Goods Depot at 2.55pm for Niddrie, near Edinburgh. Sir Murrough Wilson was the Deputy Chairman of the London & North Eastern Railway. On the same day at around 5:30pm, as the shadows continue to lengthen, a southbound express fish train appeared. Class B1 No. 61394 of King’s Cross (34A) shed begins the climb to Stoke Summit with a fish train for London on 31st August 1961. The light haze from the chimney shows that the fireman has everything well in hand for a good run up to Stoke summit, and surely the catch will be at Billingsgate Market on time next morning. This is likely to be the afternoon fish train from Hull to King's Cross Goods Depot. It left Hull around 3.40pm, regularly hauled by this locomotive or its consecutively numbered sister No. 61393. 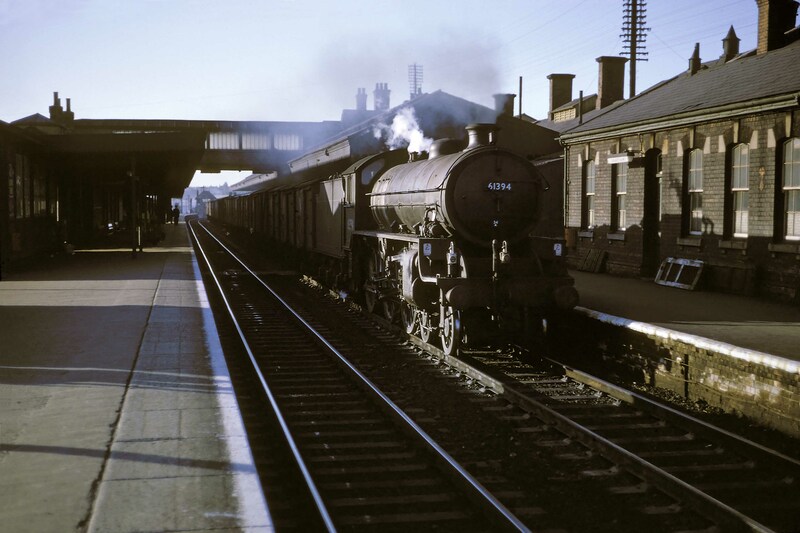 A southbound express freight, probably again the afternoon fish train bound for London from Hull, rushes through the station on 24th May 1962. At its head is class B1 locomotive No. 61303 of Hull Dairycoates (50B) motive power depot. The driver has put on steam to maintain speed on the five-mile climb to Stoke Tunnel. This train was usually hauled by a King's Cross based locomotive of the same type, so there may have been a problem with the regular engine on this day. Photograph by Cedric A. Clayson, © John Clayson. Express freight was given a high priority on the main line, second only to passenger services. Given the perishable nature of much of the produce, the timetable reflected the need to get consignments to their destinations as speedily as possible. Fish from the east coast ports and meat from Scotland was packed into insulated vans and dispatched quickly to the south, often delivered to the London meat and fish markets for the next day. The LNER and the Eastern Region of British Railways took pride in their efforts to integrate these fast freight trains into a busy railway. Until the early 1960s class V2 2-6-2 locomotives were the mainstay of the fastest Class C and Class D freight trains on the Great Northern and East Coast Main Lines. 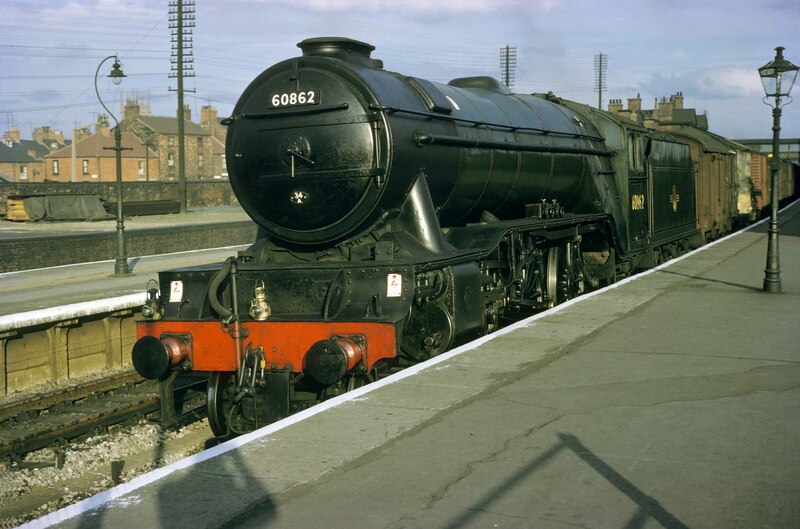 Our next photograph shows a V2 which was fitted, in 1961, with a ‘Kylchap’ double chimney for improved efficiency on express freights to York. Unusually, the train appears to be stopping at the main line platform. Perhaps the crew have a problem with the water scoop and they are having to make an unscheduled stop to fill the tender tank. For a routine stop at Grantham a freight train would normally take the Goods line to the west of the station. A northbound express freight on 21st or 28th June 1962, hauled by class V2 locomotive No. 60862 of King’s Cross (34A) motive power depot. This is thought to be a service which left King's Cross Goods Depot at about 3.40pm. 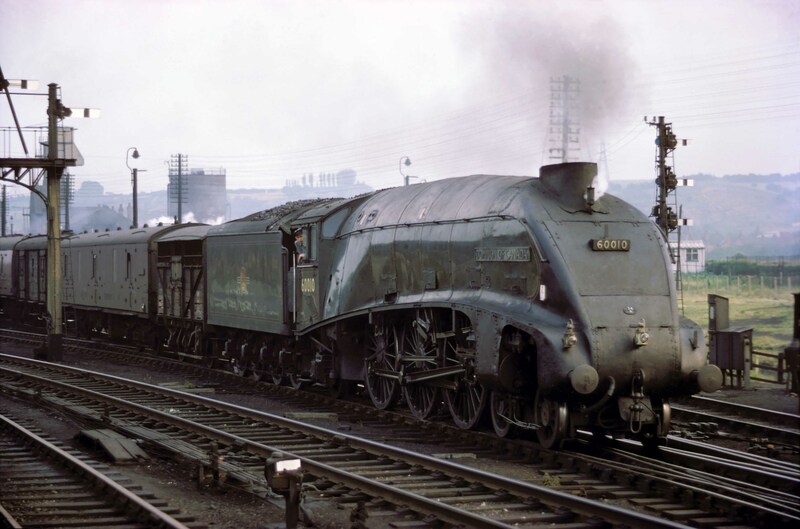 The King's Cross engine and men worked the train to York, where they lodged overnight and returned the following day on an Inverkeithing to King's Cross express freight. The BR Standard class 9Fs, though intended for heavy freight and mineral traffic, were speedy enough to be used regularly on express freights. On 16th August 1962 a northbound express freight train of perhaps 50 wagons approaches the station down the gradient from Stoke Tunnel under clear signals. It is hauled by class 9F locomotive No. 92141 of New England (34E) motive power depot in Peterborough. The first 20 or so wagons carry containers that are small by today’s standards. They were designed to fit the standard British Railways road delivery trailer of the time, still designed around the haulage capacity of a horse. The group of three figures in the distance, near the signal post, are permanent way men engaged in lifting and packing the crossing. On a train such as this one there were 200 or more wheels carrying, first, a heavy locomotive and its tender, then wagons with quite basic springs and suspension. Each wheel hammered every rail joint, leading to cracked rails, loose track fastenings and pulverised ballast. Since those days improvements in permanent way technology and a clearer understanding of wheel and vehicle dynamics have radically improved the way trains interact with the track. As previously seen, the express passenger A4s were sometimes employed on the fastest freights. By 1962, displaced by diesels from the most prestigious passenger services, they took a greater share of the freight traffic. Class ‘A4’ locomotive No. 60010 Dominion of Canada has charge of a northbound fully fitted express freight train on 12th July 1962. It has paused on the Up & Down Goods line and sets off once more on its journey. 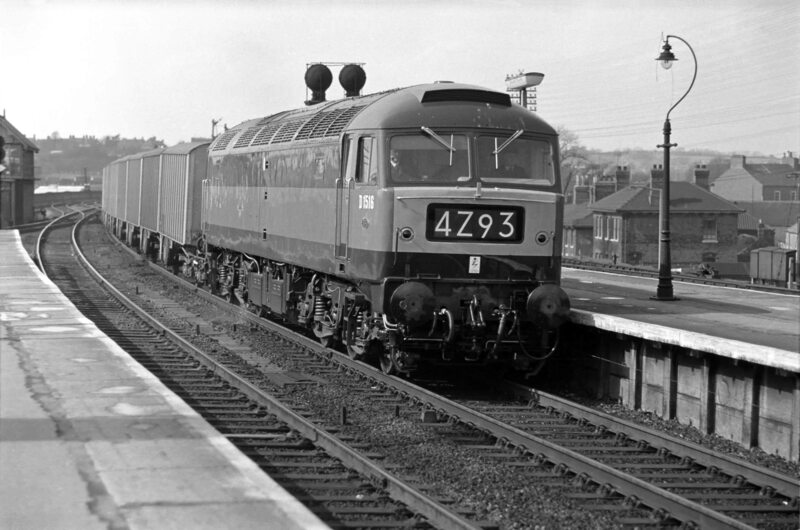 The Brush Type 4 diesel-electric locomotives, or Class 47s as they became known, were introduced in 1962. They took over express freight turns from the V2 steam locomotives and the older English Electric Type 4 (Class 40) diesels. 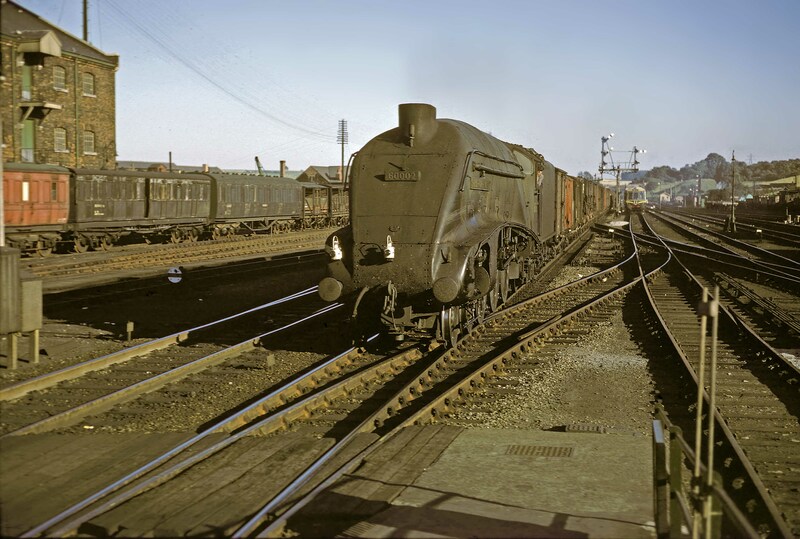 However it wasn’t just diesel locomotives that were being introduced, but also new wagons that would change the way freight would be carried by train in the future. The express freight in our next photograph is a special test train working (‘special test train’ identified by the ‘Z’ character in the second position of the headcode) headed by a Brush Type 4. This southbound Class 4 express freight is headed by Brush Type 4 locomotive No. D1516 on 18th April 1963. The locomotive was practically brand new when this picture was taken, having entered traffic on 10th April. It was one of the pilot order for 20 locomotives (D1500 to D1519) of a class of which eventually more than 500 examples were built. Amazingly D1516 still exists, being preserved at the Midland Railway Centre, Butterley in Derbyshire by The 47401 Project / 47401 Diesel Locomotive Ltd. (see http://www.47401project.co.uk/). This is a particularly interesting train, evidence of one of the railways’ attempts to develop an inter-modal freight system in the 1960s. Today it would probably be termed ‘an integrated logistics solution’. The idea, conceived on the Chesapeake & Ohio Railroad in the USA, sought to combine the advantages of rail for long-haul freight transport with the convenience of road for local collection and distribution. The vehicles are experimental ‘Roadrailer’ vans. These were able to travel on both road and rail. Each van had a set of steel flanged wheels for travelling by rail, and another set, with pneumatic rubber tyres, for the road. Either set of wheels was lowered as required. When on the road each van was a 'semi-trailer', the front supported by the towing tractor unit. On the rails each van supported the front of the van behind it. The front of the first van was carried by a special four-wheeled truck coupled to the locomotive. This system had an advantage over transferable containers, because the infrastructure required at interchange depots was minimal, whereas container traffic requires large gantry cranes. Depots could thus be more numerous and widely distributed, reducing further the proportion of road haulage. A fleet of Roadrailer vans was built by the Pressed Steel Company at Linwood, near Paisley, and they were being operated on trials at this time. Apparently the trials were not a success and the vans were never brought into general use; alternative systems involving intermediate 4-wheeled bogies when on rail were more promising. With hindsight, it can be seen that the forthcoming motorway construction programme was to undermine many of the advantages of the rail element of such a system. Also, the system was not readily compatible with transport by ship. 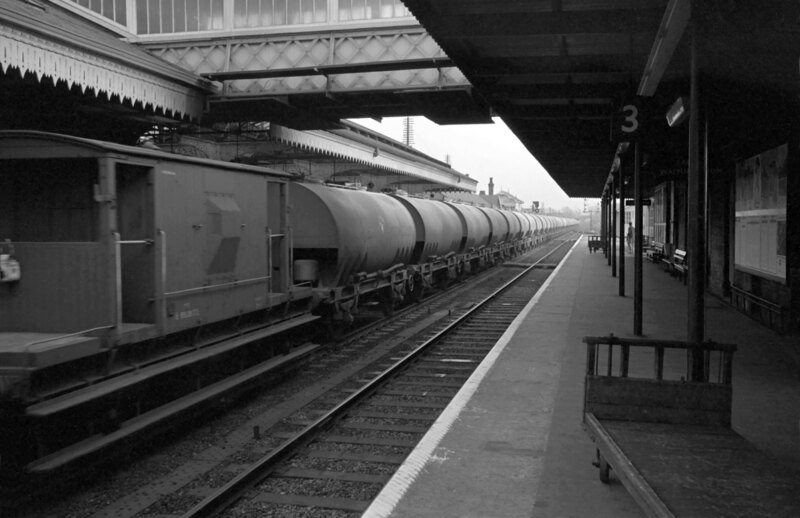 Before very long British Rail adopted the standard ISO (International Organization for Standardization) container system for inter-modal freight traffic. Our final group of photographs shows the regular Blue Circle Cement traffic from the company’s Cliffe Cement Works in Kent to a distribution depot at Uddingston in Lanarkshire. The trains returned empty in the southbound direction. There was normally a locomotive change at York. The cement was carried in a fleet of specially built 4-wheeled light alloy ‘Cemflo’ wagons shown in the photographs. The traffic began in 1961 and finished in 1969. Class 9F locomotive No. 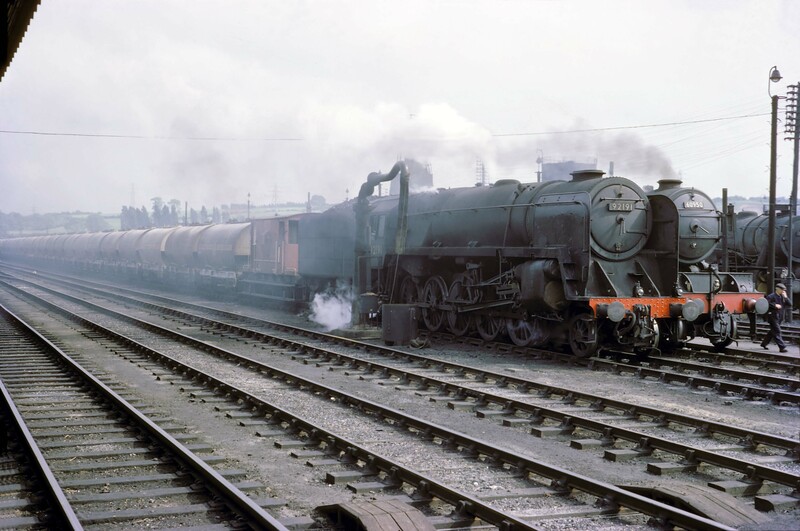 92191 of Doncaster (36A) motive power depot is hauling the northbound, loaded, Blue Circle Cement train, probably on 21st or 28th June 1962. It has paused on the Up and Down Goods line west of the station platforms, probably to wait for a ‘path’ between passenger trains. Behind is class V2 No. 60950 of Grantham (34F) shed, also on a northbound freight. 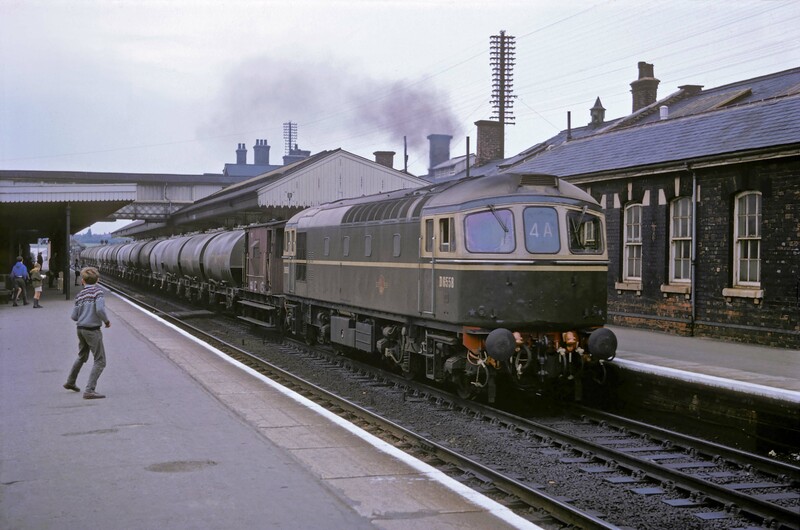 In August or September 1965 a southbound train of empty cement wagons is hauled by BRCW Type 3 (later Class 33) diesel electric locomotive No. D6558, based on the Southern Region. The cement train was always eagerly anticipated among spotters because these locomotives were not otherwise seen in the Midlands. I remember seeing the Cemflo wagons weave noticeably at speed on the straight track south of and through the station. This was an indication of instability. On 31st July 1967 a northbound loaded cement train derailed near Thirsk in Yorkshire. An overtaking express collided with the wreckage, and seven of its passengers were killed. The cause of the derailment was the poor riding of the wagons at speed. The days of the four-wheeled freight wagon on Britain’s main line railways were numbered. A southbound train of empty 'Cemflo' cement wagons speeds through the station on 3rd October 1963.